Canelo and Chavez Jr. Another Hype Job That Flopped Big Time! After Kovalev and Ward one had to wonder why anyone called Ward a “boxer”. It was jab and grab 46 or 47 times by Ward. Only a bias referee allowed him to do it for 12 rounds. Kovlev hopefully learned a lesson that he should have learned allowing Bernard Hopkins to go 12 rounds losing all of them and Kovalev not going in for the knockout. In the next one we have Russian born Kovalev knocking Ward’s Christian beliefs giving Ward food for fuel to really box his ears off. On the other hand will Kovalev’s people have any say on who the referee will be this time like that should have had the first time? This writer felt Kovalev was a five point winner but now time will tell. Julio Cesar Chavez, Jr., was possibly the greatest Mexican fighter of all time while names like Ruben Olivares, LupePintor, Salvatore Sanchez, Ricardo Lopez and Carlos Zarate are right up there. Jr. didn’t bring in his “A” game like he did with Sergio Martinez. Chavez, Jr. in that “bath robe” carrying his precious daughter into the facility made one wonder “this is a boxer?” His antics being viewed while other bouts were going on made you ask it again. Canelo on the other hand took many photos with others but had that “game face” on. The fact he looked horrible with Mayweather hopefully may have gotten erased but look who he beat? GGG? 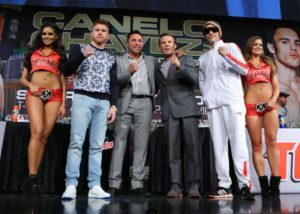 Does Canelo think he’s going to go toe to toe with him? GGG is coming off his toughest fight as champion. Not preparing for a southpaw a “light heavy” at 185(? )Jacobs was allowed to miss a second weigh-in as GGG came in at 170 meaning Jacobs couldn’t go over 180 was to Jacob’s advantage? GGG is all business. Out of the ring he’s like another great fighter in Alexis Arguello giving his opponent compliment after compliment until the bell rings. GGG is by-passing a fourth title with Saunders WBO crown in June in KAZ to finally get Canelo into the ring after a year of postponement by the Canelo camp.